Marriage in the Church is covenant, not contract. In a contract one exchanges one thing for another at an agreed upon time, place and price. Contracts are meant to protect each party from being taken advantage of; a 50/50 giving. A Covenant, on the other hand, is the complete giving of self, modeled after the Covenant of God with the Hebrews: "You will be my people and I will be your God" (Jeremiah 30:22). Just as God gives Himself fully, the couple give themselves fully to each other; it is a 100/100 giving which would be impossible except that God Himself gives us the strength to make it happen. The present rite of Matrimony for English speaking communities is experiencing its first revision since the text was redone in 1970 following the Second Vatican Council. This revised rite can be used at any time, but its use becomes obligatory on the feast of the Holy Family on December 30th, 2016. This new translation follows the World Synod on the Family (2015). Instead of a one rite fits all, the new rite has specifics for variations: between two Catholics; between a Catholic and a baptized non-Catholic; within and outside Mass; for the Convalidation (blessing) of a civil marriage. The new Rite cites that Catholics should be confirmed before entering marriage. As with all the sacramental changes of the Second Vatican Council, the difference is found in the multiple options and adaptations that can be made. What was stays but much more is added: New suggested scripture readings, music, and local customs and traditions such as the lazo, veiling, arras, crowning, etc., may be included. Weddings may now take place within Sunday Mass, as we are used to seeing Baptisms and Confirmations. Weddings may also be celebrated by multiple couples within the same Mass. The new ritual offers the option of a gathering and welcome at the church entrance preceding the entrance of the wedding party, and the Gloria is used in the gathering rites after the welcome. Nothing is radically different from what was in the former rite. 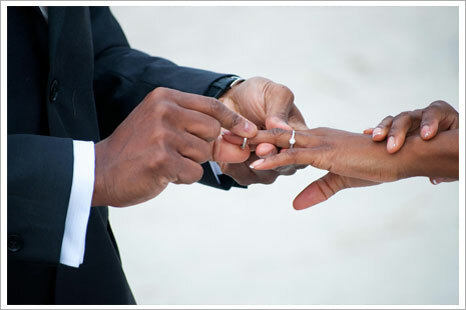 The main theology of matrimony remains: the groom and the bride are the ministers of matrimony; they preside. The ordained and the assembly are witnesses of their presiding. Additional literature will be forthcoming. The layout, options, etc., are all being executed by printers. Stay tuned for more catechesis on the new rite.